Children's film - is the time now? Myself and Danny went to hear a discussion at BAFTA about the future of children's film. This was of much interest to us as we continue to develop our own micro budget kids feature, Who Killed Nelson Nutmeg? The discussion was chaired by Briony Hanson, Director of Film at the British Council. Panellists were Linda James, Sly Fox Films and Board Member, CMF; Justin Johnson, British Film Institute; Rupert Preston, Vertigo Films; and Jocelyn Stevenson of Mind Candy, co-writer and producer of Moshi Monsters: The Movie. One: How profitable the whole genre can be. 3 children's movies together took over £50m during half term week, in the UK. This means that UK-centric kids films can survive on UK takings alone. International sales are not so critical as they are for other genres. This means if you have a story that is a UK focused, that's okay! Two: BBC Films, Film Four and most of the larger production companies are not so interested in children's films. But the BFI is, and is attempting to support the genre and increase interest. Three: The big screen can be important. This was perhaps the most eye-opening part for me. Angus Reid was in the audience and he described the joy he had of showing his zero-budget kids film to a jam packed auditorium - and how they arrived from schools by the bus load. 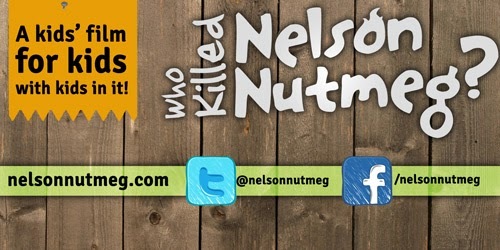 We'd put Nelson Nutmeg into the digital distribution arena in our minds. Yes, we are shooting on 4K, but that was more to create a strong digital master rather than to create a 4K cinema release. Now, inspired by Angus and by the support that the BFI can bring we perhaps should look again at the big screen. This podcast is a special. It focuses on my interview with Nigel Cole. If you don't know the name, he is the director working across both films "Made in Dagenham" and TV "Doc Martin, Cold Feet". Here is his IMDB for a full list. I asked him about his career between the two formats, how he works with writers and how to gets on in this crazy biz. See you next month listeners. As mentioned in the previous podcast, myself and Danny Stack, aided by other local legends, are pulling together a low budget feature. The twist; it's a children's film. We’ve noticed that a certain kind of film doesn’t really get made anymore, a kind of film that we both remember from when we were younger: a children’s film that has kids in the lead roles (think The Goonies, Flight of the Navigator, Explorers, BMX Bandits, and the like). These films weren’t based on best-selling books or pre-existing properties. They were original ideas made to appeal directly to a child’s sense of fun and adventure. But where are those types of films now? In 2013, none of the top 10 family films actually features children in the main role. Sure, there are a lot of family films around – but these are either animated or use adults in the central roles – or both! We realise that big expensive motion pictures need to appeal to the widest possible demographics but, with few exceptions, it seems to us that children don’t get any films to truly call their own. Films that share their sense of mischief and wonder with main characters of their own age. This is why we’re making our film. It’s silly, exciting, fun and it’s just for children. We can do it because we are making it as a low budget movie. It’s not going to compete with the big family blockbusters at the cinema; it’s created for the DVD/ instant streaming market. However, low budget doesn’t mean low quality and we’ll be using the newest range of cameras (Blackmagic 4k in fact) to bring the film to life. Plus we’ll be collaborating with the best in local talent (in front and behind the fancy camera), and celebrating the photogenic coastline of Dorset that’s right on our doorstep – one of the best places for kids to go on an adventure. As the film develops we really hope you'll follow it's development and help out if you can. A few ways to do that. Follow on Facebook, Twitter - or sign up for emails below. There will be more on casting and crewing to come.